Whisk together the cornstarch and cold water in the bottom of the slow cooker. Add the potatoes, carrots, onion, and garlic to the slow cooker. Season with salt and pepper. Season the beef with salt and pepper. Place over vegetables. Pour Worcestershire over top and cook on low for 8-10 hours. Slice beef against the grain when ready to serve. 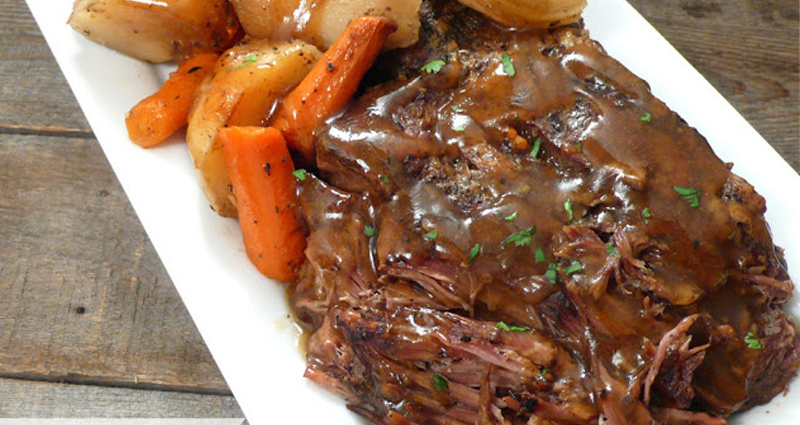 Depending on the water content of the beef, the gravy at the bottom may be the right consistency. If not simmer it on the stove, add a bit of cornstarch if needed.